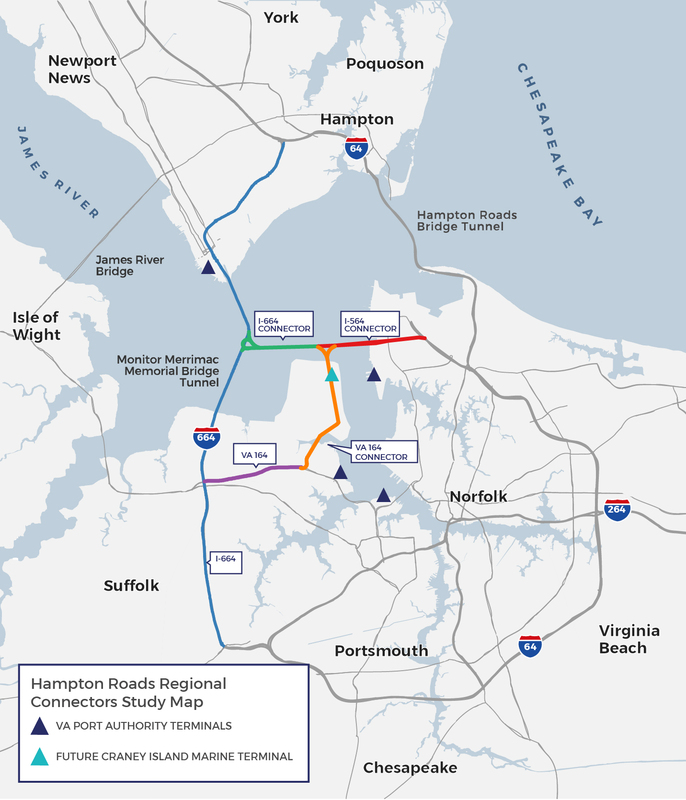 HRTPO kicked-off the Regional Connectors Study in June 2018 with funding from the Hampton Roads Transportation Accountability Commission (HRTAC). The study will focus on Hampton Roads connectivity through the lenses of congestion relief, economic vitality, resiliency, accessibility, and quality of life. In addition to these projects, HRTPO may also study other feasible projects that could improve Hampton Roads connectivity. The completed study will provide a long-term vision for improved connectivity between the Peninsula and Southside, with recommendations for project phasing. A successful regional study requires regional input and support. HRTPO engaged two oversight committees in the study process: a Working Group, made of technical experts from seven area cities, regulatory agencies, and other key stakeholders like the US Coast Guard and Navy; and a Steering Committee comprised of elected officials from the same seven cities and representatives of other key stakeholders. HRTPO will work with these committees to establish study goals and objectives, review review analytical data and results, and vet potential project alternatives. Input from Hampton Roads residents, freight operators, and business owners is critical to the study. HRTPO needs to learn more from area drivers about day-to day needs, pain points, and ideas for improvements. Over the next two to three years, the public is encouraged to review study progress and comment on proposed options at community meetings, local information kiosks, and through the comment form on this site. How could 21st Century improvements to infrastructure influence connectivity as the region evolves? HRTPO wants your feedback on the Regional Connectors Study! Tell us more about where and how you travel in the Hampton Roads region and the issues you encounter on your trips. Why is the HRTPO completing the Regional Connectors Study? To complete the appropriate studies, designs, funding analyses, and documentation necessary to determine feasibility, permitability, and transportation benefits necessary to advance corridor improvement alternatives. The study is funded through the Hampton Road Transportation Accountability Commission (HRTAC). The study will focus Hampton Roads connectivity through the lenses of economic vitality, resiliency, accessibility and quality of life. HRPTO will lead the study, with collaboration from two regional stakeholder groups. The working group is comprised of technical staff from seven local jurisdictions and other key regional stakeholders (US Navy, US Coast Guard, Virginia Port Authority, Federal Highway Administration, US Army Corps of Engineers, Virginia Department of Transportation, and HRTAC). The steering (or policy) committee is comprised of elected officials from the seven local jurisdictions.